"...lead by example: open your data to everyone who needs it, and encourage other team leaders to do the same. This issue offers you some precious advice regarding various aspects of your productivity ranging from psychological mechanisms that rule human actions to productivity myths and ways to build a profitable, scalable company while having a day job and a family. James Tonn, Podium Publishing co-founder, tells us how did he manage to develop a $1.7M company, keeping his regular job and not neglecting his personal life. "You take a company, create it from day one to be scalable and grow it over the years and it really comes down to being pretty minimal, launching before you really feel too comfortable, which you know in the software world, and learning along the way and making tweaks and testing, so it's pretty fun." Lory Fischler of Leadership Development Services explains why and how to mentor, proving that mentoring works both ways and brings profits not only to a mentee. "Mentors help their mentees explore their career direction and areas of interest. They work collaboratively to set the goals that will get them there." Rafa Garcia, who helps knowledge-workers improve their self-organization, shows how to get kids into self-organization applying the technology. "A very effective way of getting kids into this issue, is technology. They are so naturally used to tablets, laptops or consoles, that they will enjoy collecting commissions as much as if they were Super Mario collecting coins." Graham Allcott of Think Productive focuses on the science of thinking and decision-making. He indicates the processes behind human actions and links that with productivity. "What this study found is that your ability to delay gratification has huge ramifications, not just for your ability to consume marshmallows, but also in your health, wealth and education." Gonçalo Gil Mata, the founder of MIND4TIME, shows you what element to add to your productivity system, in order to better manage your focus and avoid the reactive mode. "Although a system itself will never replace the need for you to make choices and risk an option to focus on, having good guiding elements is the way to go. In fact, building proactive guidance is how you protect yourself against all the attractive fresh new emails and similar requests for attention." Productive Superdad — Timo Kiander uncovers three common productivity myths that can be busted by science. "I’ll now present 3 common "truths" about productivity and what science has to say about them. After reading this, you’ll look at the statements differently, without taking them at face value." Laura Stack of The Productivity Pro®, Inc. tells you how to retool your meetings to make them more effective. "Working on slashing the time you spend in meetings offers an excellent way for you to free up more time for your profitable, productive work, and there are several ways you can go about it." OK, I may be exaggerating a bit, but it is never too early to charge the batteries a little and regain the power and inspiration. That is why we bring 23rd issue of Productive! Magazine to you. It is full of practical information that can easily change your approach towards productivity and tips&tricks that will help you improve your efficiency right away. 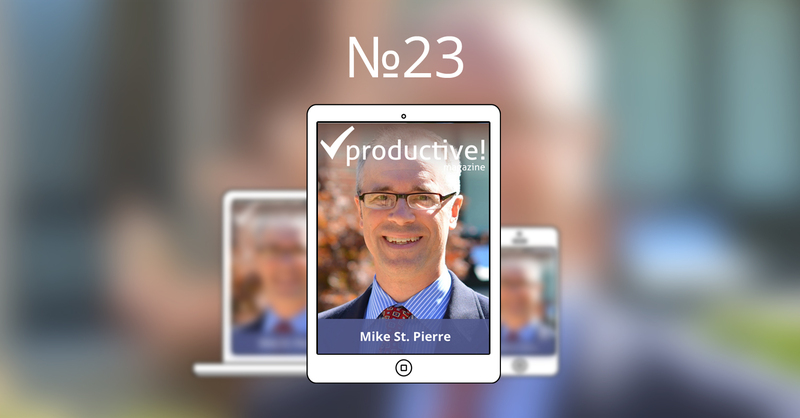 Mike St. Pierre, the President of Morris Catholic High School and blogger, tells how schools can improve their productivity and try to become iPadOnly and when it's time to stop using Facebook. "If using Facebook or Twitter or Pinterest or Google Plus stresses you out or if that takes time away from your family or the people you care about, then it's perfectly okay to take a little break from it. If it's stressing you out you don't need to use it." Lory Fischler of Leadership Development Services explains what it takes to be successful at mentoring and presents 5 proven principles that work for mentees. "The honest desire to learn is a mentee’s greatest asset. The value of mentoring is the highest for mentees when they allow themselves to be vulnerable with their mentor." Rafa Garcia, who helps knowledge-workers improve their self-organization, introduces Kanban Kids and shows how to improve your home life and prepare your children for their future in an enjoyable way. "Now, instead of repeating orders dozen of times, you just stick a colorful sticky note (or magnet) on the first column. A higher position means more priority." Grace Marshall, of Think Productive, shares 5 unexpected things she learned this summer and proves how breaking our own rules help discover just how valuable they are. "Great systems are ones that tick along nicely in the background. Unobtrusive, unnoticed, and often undervalued. Until you stop using them." Sara Caputo of Radiant Organizing explains how the 5 basics of food, sleep, exercise, communication, and space cannot be replaced with the latest app or newest technology. "In my years of consulting and coaching with teams and companies in all areas of productivity and workplace and life efficiency, one thing stands out over everything else: these five basics provide the foundation of your life efficiency." Gonçalo Gil Mata, the founder of MIND4TIME, speaks of introducing productive changes in life. He admits that changes might hurt, but it's worth it. "To change is to break loose, and that hurts. It's uncomfortable and unknown. You risk putting yourself in an even worse place than you may be. To quit your job, emigrate, start up a business, end a relationship or make a career break to travel around the globe — irreversible decisions that change your fate forever — can be frightening." Productive Superdad — Timo Kiander, brings you his practical guide to increasing your personal productivity. He lists 3 habits that stand on your way to productivity and shows how to deal with them. "Schedule a time block of 15 minutes every evening and jot down (either on paper or on task list software) the things you want to accomplish the next day. Let this plan become your "GPS navigation," guiding you through the day." Cesar Abeid, the host of the popular Project Management for the Masses Podcast explains how to put the Pareto Principle in action and be able to complete the projects related to your important life goals. "Set aside at least one hour every day to do focused work on tasks from your projects that are connected to your life goals. I call this the "power hour." Laura Stack of The Productivity Pro®, Inc. writes about smashing data silos and clearing information bottlenecks. You will learn what to do when critical information is inaccessible. "I've heard tales of military quartermasters who refused to provide much-needed equipment to soldiers, because if they did, it would disrupt their perfect organizational system. Sometimes, when you give people a little power, it goes to their heads, and they feel the need to wield it, to the detriment of the organization as a whole." Productive! Magazine No. 22 with Crystal Paine — discover the freedom that comes with intention, organization and simplicity. You will soon get the chance to read the summer edition of Producitve! Magazine. While we put the finishing touches on the issue, read what we have got for you this time. Crystal Paine, the founder of MoneySavingMom.com (top personal finance blog with 1.5 million visitors per month), tells how to gain fulfillment and peace that stems from keeping life simple and planned. She explains why intentional money-spending and setting strict money-related rules is worth investing the time and how to learn to say "no". "I encourage people to think about opportunities. Think about your expenditures, think about everything before you just spend the money and say "yes". Really stop and consider: is this wise? Do I have time for this? Do I have money for this? Am I going to regret this in three or six months from now?" Lory Fischler of Leadership Development Services explains what to do if you feel like your career is stalled and your current assignments have lost their appeal? "Those who engage in mentoring relationships are less stressed, learn more quickly, increase their productivity, and create safety nets for themselves. They make better decisions about their careers and are adept at finding the right mentor to help them navigate their organization." Andrzej Bernardyn, blogger and coach, questions "Eat that frog" rule by encouraging to eat some tadpoles first. "We are only humans and if something scares us, we would find numerous excuses in order not to tackle the hard thing." Graham Allcott, the founder of Think Productive, presents a fantastic case study of introducing a 4-day working week in his organization. See yourself that it is not about how much time but how effective you work. "4-day week puts the 'balance' and the 'life' back into the over-used phrase 'work/life balance'." Sara Caputo of Radiant Organizing shows the best way to improve your productivity and advance your career. It's about sleeping your way to the top! That’s right - literally :). "While most adults have sleep habits pretty well hardwired into their life, small changes and shifts can bring about big results. Tonight, I encourage you to do just one thing differently and see how it helps your efficiency and productivity in all areas of your life." Gonçalo Gil Mata, the founder of MIND4TIME, proposes three major specific features you should address when building and fine-tuning your personal productivity system. "Remember: responding immediately rarely means you are being productive. Emergencies shouldn’t be mixed in crowded channels like email." Productive Superdad - Timo Kiander, answers a simple question: How to spend more time with your family and not decrease your performance at work. Would you like to give your beloved ones more time? REad the article. "Remember that every new commitment consumes your time, and eventually, it will come to reduce available time you have for your family." If you’ve ever worked for a large organization - says Laura Stack of The Productivity Pro®, Inc. - then you know your co-workers don’t really care about your productivity. Check out the guidelines for leaders who need to protect their team members and themselves from predatory behavior. "We’ve all encountered hidebound “dinosaur brains” who block us for petty reasons. Find ways to go around them to do what’s best for the team. But be careful: some bottlenecks may feel threatened if you do so too overtly." P.S. The proud sponsor of the Productive! Magazine is Nozbe. nine practical articles helping you get closer to a systematic and productive workflow and satisfying life. Read the new edition as you like. 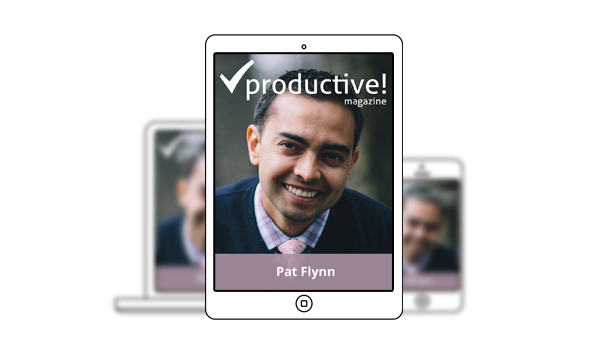 Interview with Pat Flynn — a serial entrepreneur for whom getting laid off was the best thing that ever happened to him. Only then did he found out how to run business and earn money and be able to spend the majority of time with his family and on the stuff he likes. Watch or read the interview to learn Pat's story, Pat's strategies and methods. "The passive income part was very much inspired by Tim Ferris’s The 4-Hour Workweek and his ability to put systems and automation into his businesses. The idea is that you don’t have to be present in order for transactions to happen." Sara Caputo wrote a list of five differences between average and uber-productive people. You can hang this list on the fridge door and try to tick off from top to bottom within a year or so. I am sure you can make it. Kosio Angelov teaches how to effortlessly form new healthy habits and stick to them using his "Habit Formation Trifecta" system. As a Productivity Ninja, a coach and "time management" author, Grace Marshall reveals a time management’s guilty secret and shows how to prevent the constant guilt from stealing your precious time and strength. "Prowling in the pressure of trying to keep on top of everything is the worry of letting someone down, the struggle of trying - and failing - to please everyone and get everything done." Les Taylor prepared a catalog of attributes and skills that are key to being a high performer in any organization and Gonçalo Gil Mata presents his first article of series on building your reliable, performance-boosting personal productivity system. Have you experienced the burning excitement of a new goal and the inspiration that follows by finally deciding to make a change? And once started working on it and having even gained some serious momentum your inspiration wore off? Patrik Edblad shows you how to stay motivated by leveraging small wins. "Big goals are great but only for planning your progress. To actually make progress, you need to fall in love with the everyday grind of pursuing your goal. If you don’t, it will quickly turn into a huge burden on your shoulders and a haunting reminder of what you couldn’t achieve." You will also read Laura Stack's guide to reducing inefficiencies and breaking bottlenecks and Marcus Platt's little reference guide to Nozbe. Would you like a sticker for your Apple device? In the Productive! Show section in the magazine, you can watch how I've decorated my MacBook Pro with custom Nozbe sticker designed to fit the Apple computer. Which article do you like most? Surely one of the columns has made you think, analyze, revise your attitude or habits. Why don't you share it with your friends and colleagues — it might help them get more productive, less stressed and simply happier! Productive! Magazine no. 21 — the top quotes. Here is the list of quotes from the latest issue of Productive! Magazine. We are going to use them to promote this edition and show our appreciation for the great contribution by the authors of the articles. Do not hesitate to use any of the below sentences to share it with your friends on Twitter, Facebook etc. The magazine is free, is contains no ads and offers a whole range of ever-green, practical tips. This issue, as usually, begins with an inspiring interview. This time, our Editor in Chief got to talk to Joost Wouters - international business consultant and the author of "The 15-Minute Inbox" - a book on controlling your email and creating time. Check it out to see how to easily harness your email inbox and learn more about Joost's productivity-related experiences. "People are spending so much time in their inbox. It is like they are leading their teams with e-mail. They write so many e-mails that they can hardly find time to think or to be with their team." Then, continue reading and enjoy 7 practical articles on efficient blogging, creativity and productivity boosting music. 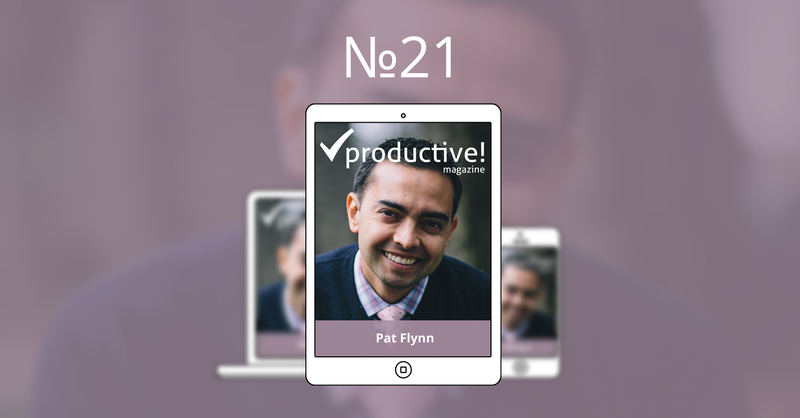 In this edition of our monthly magazine, you will read a great article and practical articles by amazing people whose aim is to show you how to manage your time and projects in order to gain an extra day or two. Their articles are backed by years of experience and work with clients from all over the world. "Everyone’s agendas are put in your e-mail mailbox. It is not your agenda. If you spend your whole day being reactive, you are like a fire fighter. You are constantly reacting to things. And the people I work with get paid to be proactive business builders rather than reactive fire fighters." Exclusive interview with Joost Wouters, the author of The 15-minutes inbox and a consultant who helps business leaders to identify and remove obstacles on their way to substantial growth. "For many, blogging can be a total time drain, but with the right techniques, you can blog more efficiently." Jill Celeste, a Personal Branding Coach, offers you 5 easy to implement time management tips you can use for more efficient blogging. "Whatever gives you sparkling eyes and stomach butterflies will usually point you towards a valuable experience. Acknowledge it and just accept bumps on the road as being part of life!" If you read the previous article by Gonçalo Gil Mata (WhatsTheTrick.com), you are now ready to learn his 5 tricks you can use to effectively deal with procrastination. "It doesn’t matter if your poor performance stems from boredom, overwork, or a lack of interest in leading your team properly. Whatever the cause, when you do the minimum expected, you’ll get minimum rewards at best." Beware. No matter how good your intentions or how well you follow the rules, one day you can realize you’ve worn your way down into a productivity rut. Laura Stack (The Productivity Pro) knows some ways to avoid such situations. Check them out. "Imagine a caveman working with his back to the opening of a cave. No matter how hard he focuses on his work, his limbic system is constantly monitoring the cave entrance. This system functions mostly in his subconscious, but when a twig snaps, for example, the limbic system consciously warns him of the sound." Do you listen to music at work? If so, are you sure it helps and not hinders your productivity? James Tonn (Podium Publishing) wrote a fantastic article about the way music impacts our efficiency. "(...) actually it’s not as insane as it first sounds: planning creates a mindset that in turn creates the ability to think and act more spontaneously. The same is true for creativity." Learn 5 ways to think more productively about creativity and more creatively about productivity by Graham Allcott from Think Productive. Did you know that there is Productive! 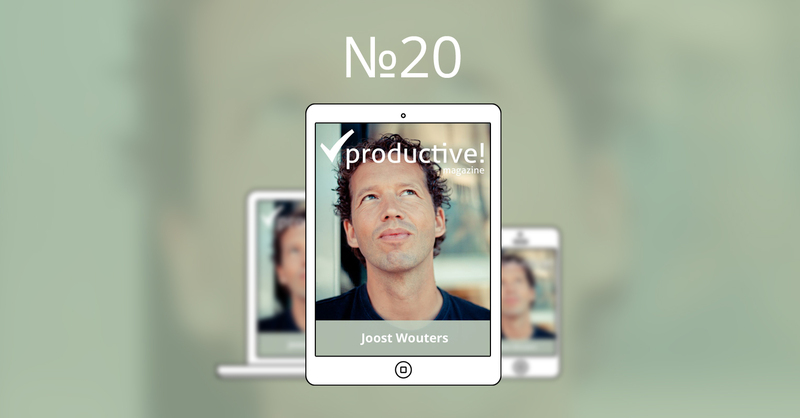 Magazine in Spanish full of articles written by Spanish productivity experts and a fantastic interview with Jeroen Sangers - personal productivity and time management trainer, consultant and speaker. 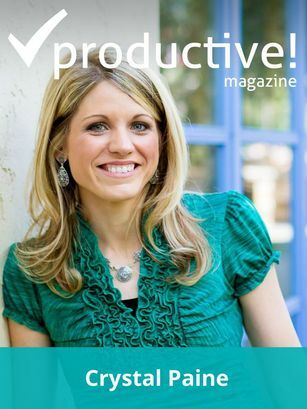 Read the latest edition of Productive! Magazine Polska. We've got 7 practical and motivating articles by productivity coaches and bloggers waiting for you as well as the interview with one of the top Polish social media expert - Maciej "Mediafun" Budzich. 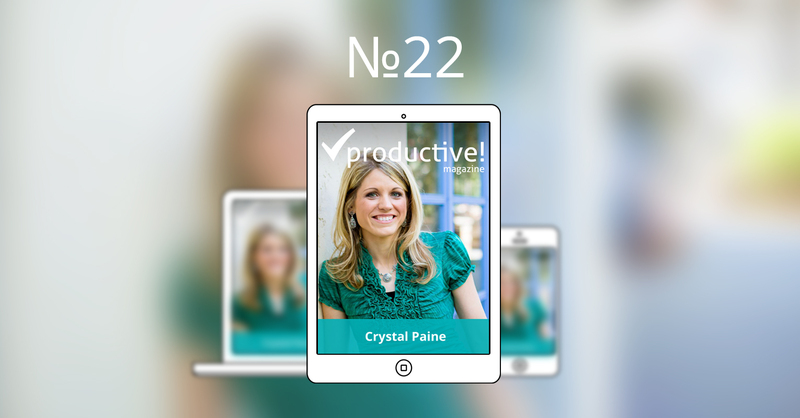 Please, do let me know how do you like this issue of our monthly and share Productive! Magazine with your friends and colleagues - it might help them get more productive and optimistic about their work. As a Productive! Magazine reader you can buy the book by Joost Wouters "The 15-Minute Inbox: Control Email. Create Time. Lead Your Business" with 50% discount and get the audiobook for free. Click here: buy the e-book with 50% discount and get the audiobook for free. Hope you'll enjoy this blog.